The first game of the final series of the season did not lack excitement, especially with 8,719 fans packed into an extra inning showdown at The Diamond. The Flying Squirrels (62-73) grabbed a 3-0 lead with homer runs from Luigi Rodriguez and Matt Winn, but could not hang on as Harrisburg (69-65) came back and forced extra innings in a 4-3 Senators win. The final series of the season continues on Saturday at 6:05 p.m. Saturday in Funnville is Harry Potter Night with Colossal Fireworks following the game, presented by CarMax. Matt Winn and Luigi Rodriguez each homered to headline the Flying Squirrels attack on Friday night at The Diamond. Rodriguez drilled his 14th home run of the season – a solo shot – in the fifth inning for a 1-0 Richmond lead. Winn connected on his first since being summoned from San Jose – a powerful blast over the left centerfield fence. 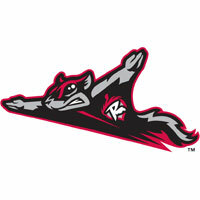 Winn’s homer followed a bloop double off the bat of Jonah Arenado and gave the Flying Squirrels a 3-0 advantage. The Senators chipped away at the lead with a pair of runs in the seventh and one more in the eighth to force extra innings. Harrisburg executed a sacrifice bunt and a base hit in the tenth inning, scoring the gifted runner from second base. Senators closer Roman Mendez closed out the win with a scoreless bottom of the tenth. Harrisburg improved to 11-7 in extra-inning games while Richmond fell to 4-7. Richmond starter Jake McCasland and Harrisburg’s Cesar Vargas each turned in quality starts yet each received no-decisions. McCasland looked refreshed to begin his final start of the season. The righty needed just 10 pitches to retire the side in the first. He put away Daniel Johnson on a breaking ball to end the inning. McCasland issued a one-out walk in the second, but quickly picked up a double play to end the inning. Harrisburg starting pitcher Cesar Vargas turned in a quality start and allowed just a pair of hits over the first three innings. Rodriguez launched his 14th home run of the season to begin the fourth and then Vargas quickly set down the next three batters. Vargas allowed the homer to Winn in the fifth, albeit it should have been a solo shot instead of a two-run blast. Arenado lofted a fly ball into right centerfield and the win fooled centerfielder Hunter Jones. The ball dropped in for a hit and then Winn demolished his first homer of the year for a 3-0 lead. Austin Davidson pinch-hit for Vargas in the top of the seventh inning, ending his outing (6 IP, 6H, 4K, 0BB). Davidson walked in h is plate appearance, loading the bases on McCasland. Hunter Jones then put the Senators on the board, ripping a two-run single into left field. The run-scoring hit ended McCasland’s outing. With the tying run in scoring position, Sam Wolff entered and struck out carter Kieboom to end the inning while keeping the lead intact, 3-2. In his last start of the year, McCasland turned in one of his finest starts of the season. The righty worked 6.2 innings and allowed just the two runs on five hits. He induced a pair of double plays and tossed 100 pitches in the no-decision. McCasland walked four and struck out five. The Senators tied the game in the eight, facing three different pitchers in the inning. Carlos Diaz walked Drew Ward to load the bases. Dusten Knight entered with two outs and walked the first batter Osvaldo Abreu, tyint the game, 3-3. Knight punched out the next batter and struck out three in 1.1 innings pitched. Ryan Halstead suffered the loss by allowing the unearned run in the tenth. Derek Self (5-0) picked up the win with a pair of near-perfect innings.